Good, Fresh Food at a Great Price! Like most people, I buy the majority of my food at the grocery store. During the summer, I like to stop by the Exeter Farmer’s Market, but in the winter I find it hard to source locally grown produce. The local food movement is growing in popularity, and has attracted some attention in the news lately as the provincial government is reintroducing the Local Food Act. Purchasing the Good Food Box is one way I can get local, fresh produce year-round. 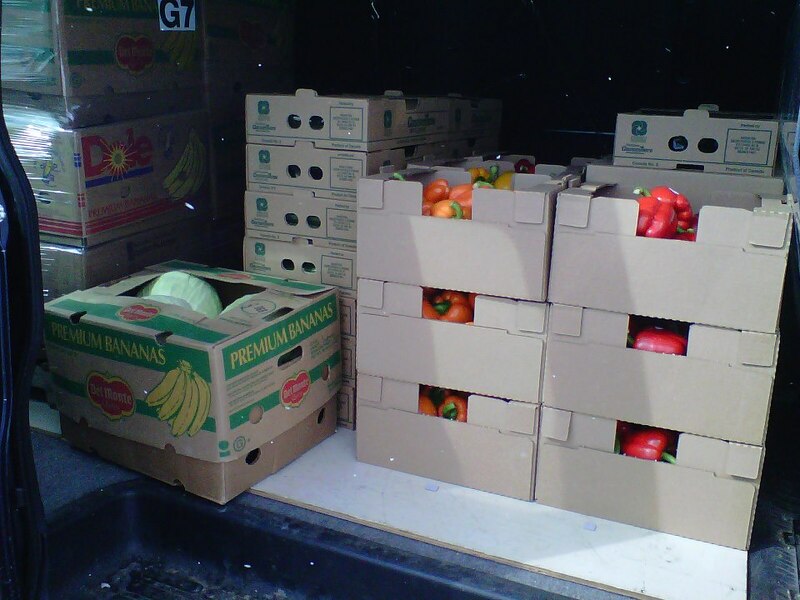 The Good Food Box is a community-based project which provides Huron County residents with local vegetables and fruits monthly. The best part is the Good Food Box is only $15. According to their website, buying a Good Food Box means you can save up to 40% off grocery store prices! 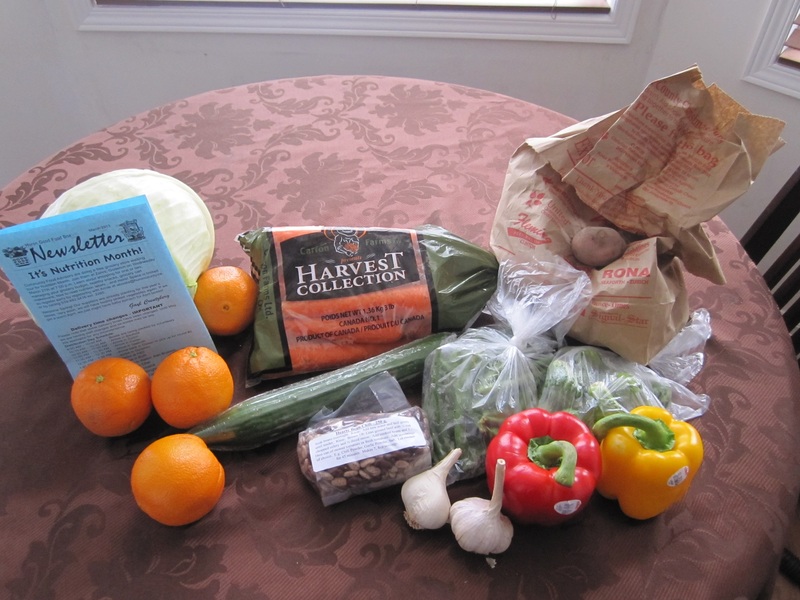 Here’s what I got in my Good Food Box for the month of March: a bag of green beans, a cucumber, 2 heads of garlic, 3 pound bag of carrots, hearty bean chili mix (with recipe), 5 pounds of potatoes, a whole cabbage, 2 peppers (red/yellow), 4 oranges, and a bag of brussel sprouts. Included in the box is a handy newsletter with recipes using the box’s contents as well as nutritional information and tips. 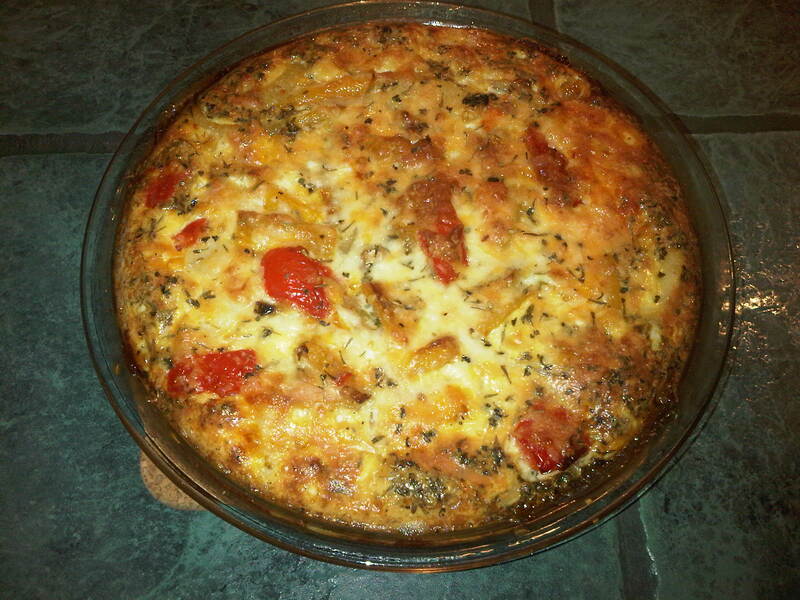 I used a recipe from one of my favourite cookbooks (The Looneyspoons Collection) to make a healthy crustless quiche for dinner using the peppers, potatoes, and garlic from my box. Delicious & Nutritious dinner made from items in my Good Food Box this month. You can place an order at a neighbourhood host site by the first Friday of each month. The nearest host site for me is the Exeter Library. All orders must be pre-paid in cash at the time they are placed and orders can be picked up on the third Thursday of each month at the host site. Check out the Good Food Box’s website or visit them on Facebook. Join the local food movement!